CTE is at the front of innovation in education in Washington. There is nothing more exciting than seeing students engaged in studies that push them to their limits and spark their imaginations. It is our state’s responsibility to prepare all students for success in career, college, and life. 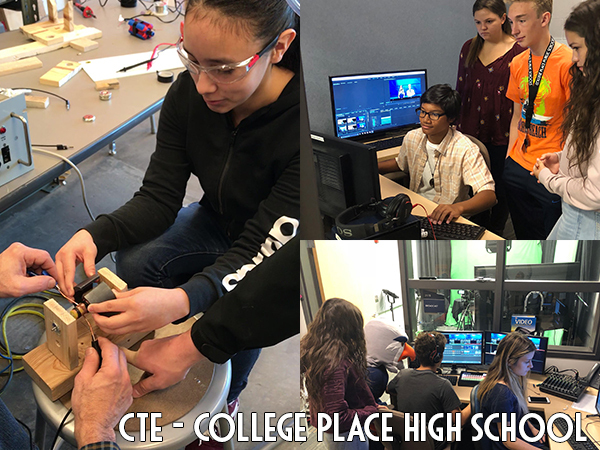 CTE programs in Washington are aligned with rigorous industry and academic standards. Teachers participate in meaningful professional development on curricula and instruction, standards and assessment, and academic integration. Program partnerships and advisories communicate this vision with business and industry partners. Such programs meet the demands of the new economy. We are driven to close the skills gap by removing the stigmas and stereotypes that discourage students from pursuing the many available jobs and opportunities. To develop marketable in-demand skills. Student members of the College Place High School Future Business Leaders of America (FBLA) chapter competed in the regional competition in Kennewick, WA on February 7. FBLA is the premier organization for student leaders preparing for careers in business, management, entrepreneurship, and technology. It offers students an opportunity to compete in up to 94 different events across high school and middle school grades. Other students who competed were Richard Pontius and Connor Murphy. Many of the students will be eligible to compete in the state competition in Bellevue on April 10&dash;13. SEATECH (Southeast Area Technical Skills Center) is established to provide advanced-level Career and Technical Education programs based on rigorous academic and industry standards, preparing students for post-secondary education and successful entry into high-skill, high-demand careers and employment.